Sharks have swarmed the media this summer and it’s not even Shark Week yet. A great white shark swims off the coast of Massachusetts. Studies show the predators’ population is returning to the waters in great numbers. When men are caught taking selfies with a great white shark right outside of New York City, you know something’s a little fishy. Fisherman Steve Fernandez said he and his friends were not far from 116th Street when they caught a baby white shark. They took pictures before releasing it back into the water about a mile off Rockaway Beach June 22, Fernandez told the New York Post. “As soon as we saw it, there’s no mistaking it. It’s basically a miniature version of the shark you seen in the movie ‘Jaws,’” he said. This wasn’t the only great white shark caught swimming just a little too close to the Big Apple. In another recent spotting, a photographer used a drone to film a young great white greeting paddle boarders in Manhattan Beach in June. But a recent study provides some insight into these occurrences: After years of decline, the great white shark population is finally on the rise. The study, conducted by researchers from the National Oceanic and Atmospheric Administration and published June 11 by PLOS ONE, analyzed shark records from 1800 to 2010 and found the abundance of great whites has increased about 42 percent in the northwest Atlantic Ocean since its predicted lowest point around 1990, according to lead author Tobey Curtis. Curtis tells U.S. News researchers think there may be a white shark nursery in the waters off New York, which could explain why the city seems to be a hangout spot for young sharks. Conservation efforts are largely to thank for the predators’ return over the past couple of decades, he adds. But while the great white shark population is rising, other shark populations are dropping, Curtis says. Their decline is partly due to lack of conservation efforts, but some species also fall victim to fisherman more easily than white sharks because they are less resilient. Larger white sharks are able to escape and survive nets and hooks more easily than other sharks, such as hammerheads, he says. A separate study published by PLOS ONE in June suggests the great white shark population is also surging in California waters. The recent research contradicted a previous study published in the journal Biology Letters suggesting there were only 219 mature and sub-adult white sharks in “central California” and only about 438 in the entire eastern North Pacific Ocean. After finding such low numbers, the researchers tried to get the sharks protected under the Endangered Species Act, which would help prevent the species from being traded, sold, captured or disrupted, according to the National Wildlife Federation. The newest research published in PLOS ONE suggests there are actually 2,400 white sharks just in California waters, meaning that the species is not in danger of extinction. “That we found these sharks are doing OK, better than OK, is a real positive in light of the fact that other shark populations are not necessarily doing as well,” George Burgess, director of the Florida Program for Shark Research and the study’s head author, told The Los Angeles Times. This September 18, 2012, photo provided by OCEARCH shows scientists tagging a great white shark named Mary Lee off Cape Cod, Mass. 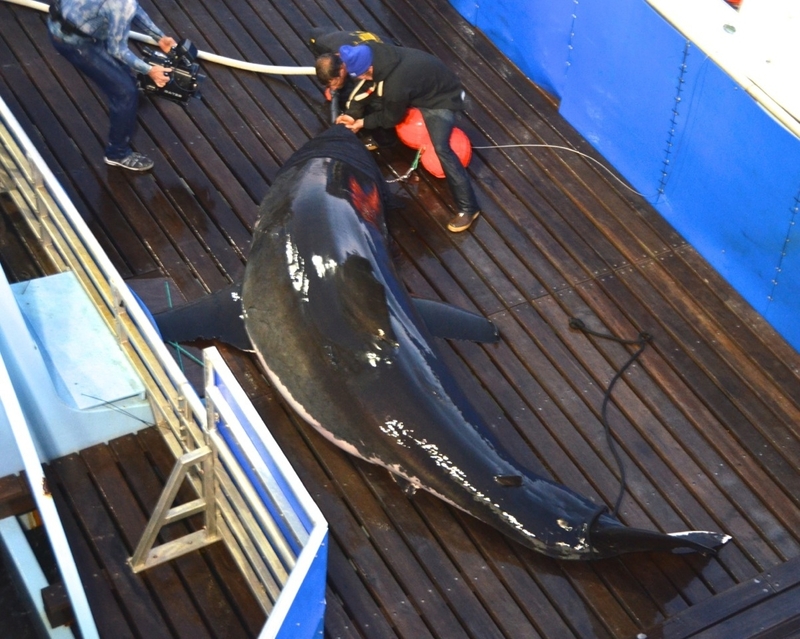 Among the great white sharks dominating the waters is a 14-foot, 2,300-pound fish dubbed “Katharine” by the scientists who are tracking her, reported ABC News. Greg Skomal, a program manager and senior biologist at the Massachusetts Division of Marine Fisheries, says Katharine is one of 39 great white sharks he and other researchers are watching in the Atlantic Ocean. Sharks like Katharine, who was tagged off Cape Cod last August, provide critical information about great whites’ breeding habits so people can learn how to protect them, says Chris Fischer, another one of the scientists tracking her. Skomal says they began the study in 2009 and for a while they believed they had figured out the sharks’ migratory pattern: In the summers, they moved north and in winters, back down south. But some, like Katharine, have broken this rule: Instead of moving north this summer, Katharine traveled to the Gulf of Mexico. Skomal says roughly 25 percent to 30 percent of the great white sharks they are tracking have more complex behaviors and follow more dynamic movements than once thought. But before Katharine starting heading toward Texas, another shark – not a great white – left its mark in Galveston. Tooth marks lined the upper part of 14-year-old Mikaela Medina’s back after a shark bit her on June 8. She didn’t feel the pain, she told KHOU-TV, but went to shore to have her mother take a look. “I just felt like something bumped into my back,” she said. One day later, a 16-year-old boy was reportedly bitten by a shark at Cape Henlopen State Park in Delaware. According to the International Shark Attack File, directed by Burgess at the Florida Museum of Natural History, Texas and Delaware are not common states for shark attacks. Of the 47 unprovoked attacks in the U.S. last year, almost half occurred in Florida. Most of the others took place in Hawaii and South Carolina, according to the research. Despite the odd locations of the attacks, Burgess says there seem to be fewer attacks worldwide this year compared to last year. He says there have been 26 attacks so far this year, with two fatalities, one in South Africa and one in Australia. Sixteen of the attacks were in the U.S., with no fatalities. 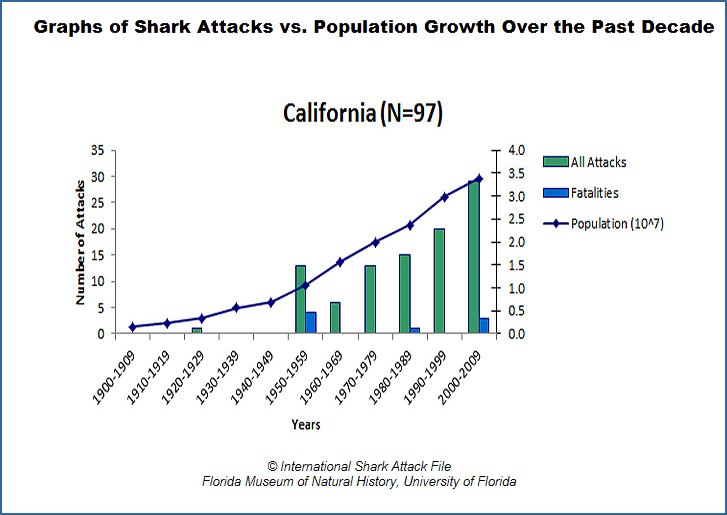 The ratio of attacks each year is low compared to the amount of times humans and sharks are near one another. Humans and sharks are actually very close to each other on a regular basis, says Burgess. “Certainly anyone whose spent any time in the sea, just recreationally in the surf zone, has been within 10 or 15 feet of a shark at some point in their lifetime,” he says. At any given time, “hundreds or perhaps thousands” of people are that close to a shark, he adds. In fact, statistics show that sharks have a lot more to fear than humans do. Burgess says humans are killing about up to 37 million sharks per year, while sharks only kill around four or five humans each year. Most sharks are dying when fisheries aiming for another type of fish catch them by mistake and have to throw them overboard, he says. However, Burgess warns that if people do not learn more about shark safety, the number of shark attacks on humans are sure to increase. Naturally, a larger population, increased tourism and water activities means more bites, even if the shark population remains the same, he says. A recent study shows the shark population is growing in California waters, contradicting previous research. 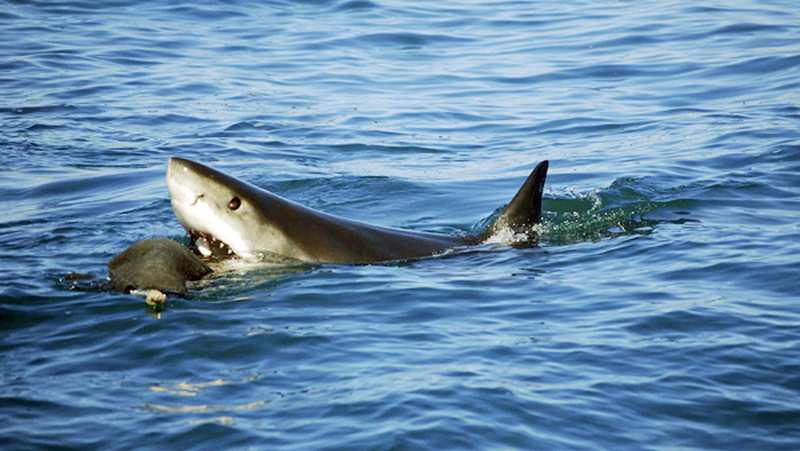 Humans are not a normal part of a shark’s diet, he says, but sharks can mistake people for fish in certain situations. One way of avoiding an unexpected encounter is to stay in a group. Sharks, like other predators, look for the weak stragglers in the pack who linger behind, and tend to attack prey that looks to be alone, Burgess says. And if your parents have ever told you not to take a midnight swim in the ocean, they were right. Sharks feed the most from dusk until dawn – and you don’t want to end up being a midnight snack. The last bit of advice Burgess provides is to ditch your rings and bracelets before hitting the waves. To sharks, shiny jewelry can look like fish scales, reflecting light as you move in the water. Burgess urges people to remember that, when they enter the ocean, it’s like entering the wilderness. Most people don’t think about it, he says, but they are invading other species’ territory. “Can you imagine walking into the Serengeti in your bikini, barefoot and not worrying about the big animals that can do you harm?” he asks. “Although we wander in their naked and stupid, most of us come out just fine,” he says.